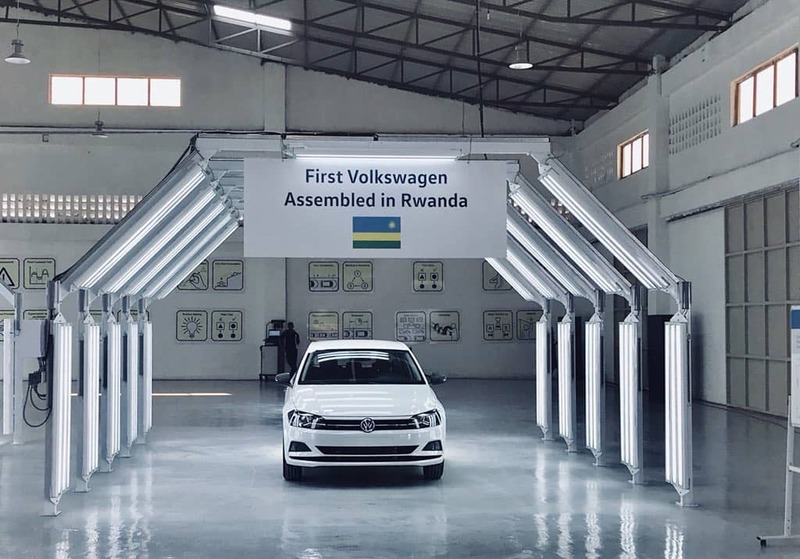 President Paul Kagame has launched first Rwandan car Assembly plant by Volkswagen with a notice that, the country and Africa is getting what it deserves; brand new instead of second hand. 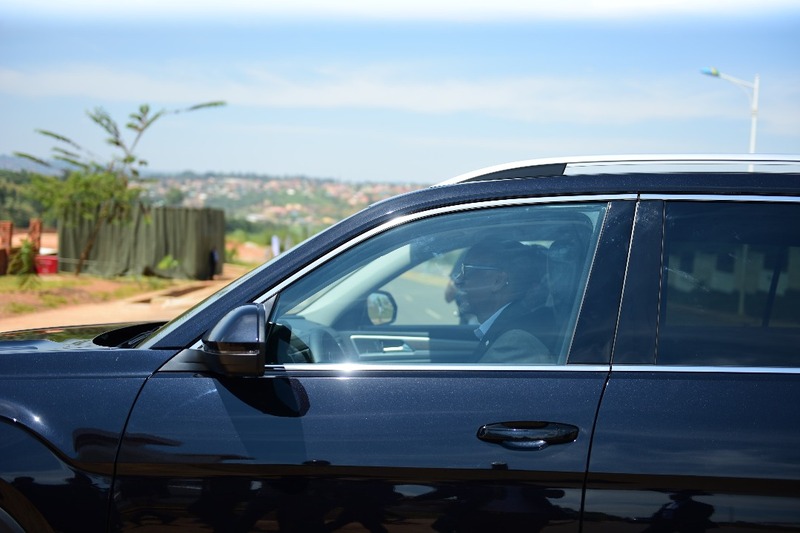 On Wednesday morning, the media and other dignitaries were driven from Kigali Convention Centre in some of the VW brand new Passat vehicles to the assembly plant. 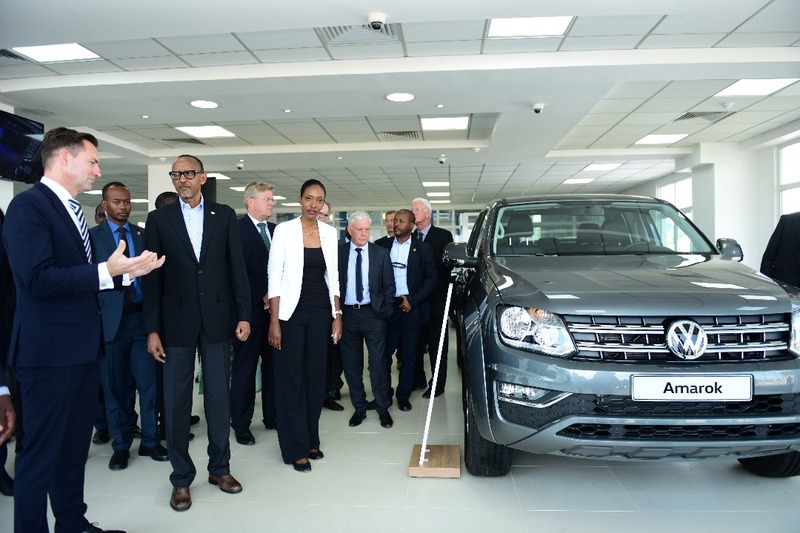 Around lunchtime, Kagame joined the excited participants who had seen the first car assembled in Rwanda in the showroom. The president himself drove one of the first products, a black VW Teramont. 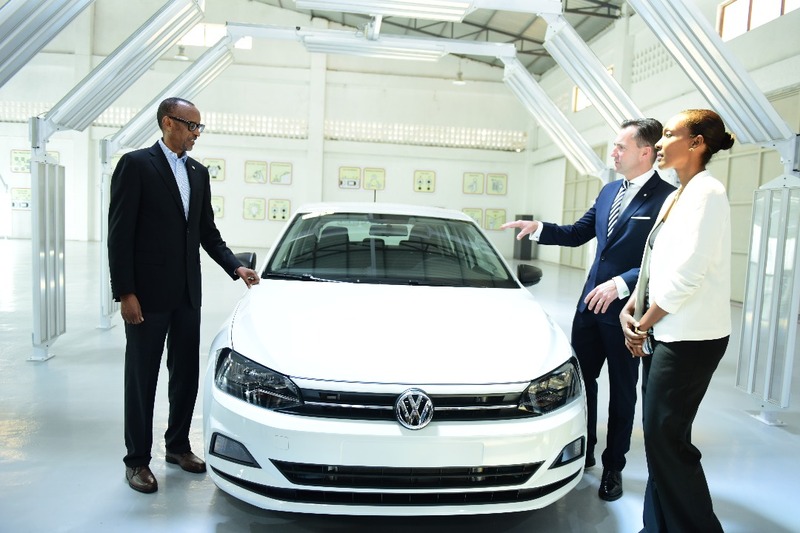 He recalled the history of vehicles in Rwanda where Volkswagen was the first brand ever to hit the Rwandan roads. “One of the first vehicles to come to Rwanda was Volkswagen. When I was a child, before we were thrown out of this country, I used to see the beetle when the engine was still at the back,” he said. It had been a long journey from that point, and Kagame said, it was hard for many to believe, that the recent project could mature. “Some found it hard to believe that German cars could really be built in Rwanda. Yet today, the first vehicles are rolling off the assembly line,” he said. Kagame said, the first VW car to have reached Rwanda is old and could cause pollution, but Rwanda and Africa is not a dumping site anymore. “Africa does not need to be a dumping ground for second-hand cars, or second-hand anything. In the long run, you end up paying a higher price anyway,” Kagame said. Kagame was saying this from a recent development where taxes for second-hand clothes and footwear were increased to discourage entry of second hand and promote local apparel industry. Similarly, two years ago, Rwanda adopted new depreciation rates on car taxation. 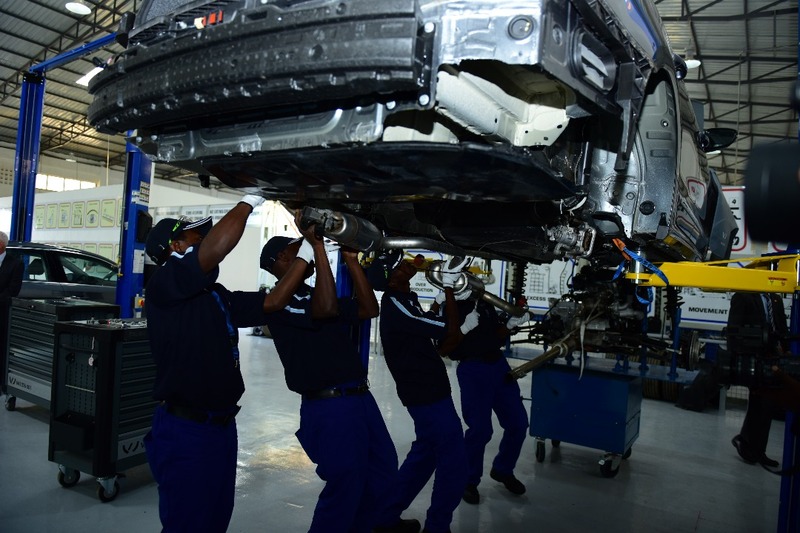 The vehicles being assembled in Rwanda are VW Teramont, Passat and Polo models and the plant is expected to employ 1000 workers, mainly locals, from 100 workers currently. The assembly plant is the fourth of its kind in Africa after Nigeria, Kenya and South Africa. Kagame said, that Rwanda and Kenya most especially will have to work hand in hand to bring this project to a success. At the launch, Kagame said that Africa is not merely positioning itself as a new low-cost hub to manufacture goods for export. “African consumers will also be among the biggest contributors to growth in global demand in the years ahead,” he said. What is Volkswagen Offering exactly? The Kigali VW assembly plant will in the future provide brand new cars to the local consumers, but other services are already in the offer, effective Wednesday. All the services were launched as VW Integrated Mobility Solutions. According to Michaella Rugwizangoga, the CEO of VW Rwanda, a couple of services are already on offer. “The first service is corporate car sharing to institutions, corporates and NGOs. “We shall start with 40 vehicles and increase to 150 vehicles with time. Then we shall bring ride-hailing with 50 vehicles,” said Rugwizangoga. In 2019, she said, they will introduce public car sharing with vehicles available in stations. The cars would be self-driven. “We are in charge of maintenance of the cars,” said Rugwizangoga. The VW entered the local market with experienced contractors. 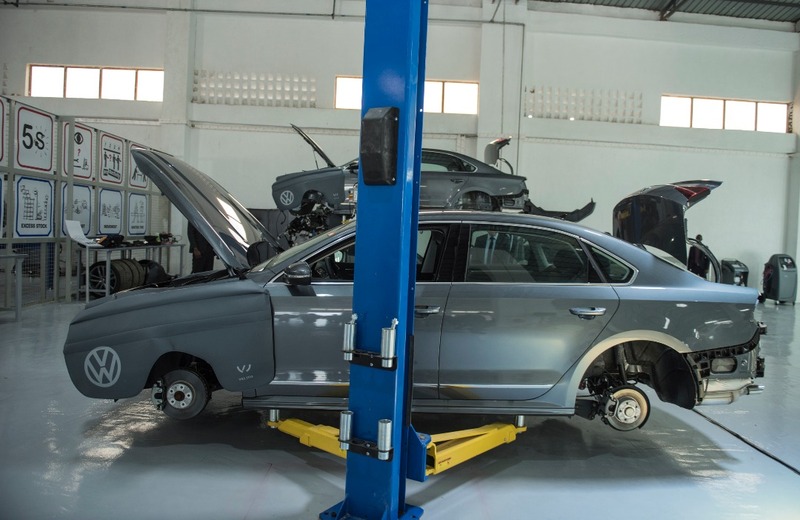 All the VW services in Rwanda are managed by Compagnie Francaise de l’Afrique Occidentale (CFAO), an automotive, healthcare and consumer good service company with 165 years of experience in the business on the continent. It will assemble, distribute and backup VW products. VW Group is the biggest automotive company with 10 million vehicle sells in 2017 and 220 production locations worldwide. I am so proud of my country and it’s leader. This shows every country around the world that Rwanda is on an important mission and in a few years to come, the world will be surprised by her success. #ProudToBeRwandan.